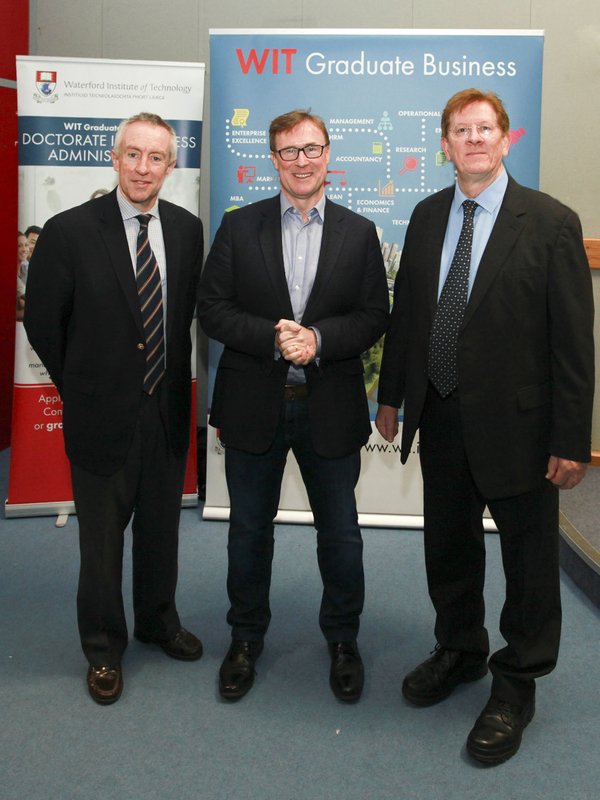 WIT Business School in association with the Business and Postgraduate Business Society were pleased to welcome Kevin Toland as part of its occasional speaker series 2017. Kevin is the current CEO of Dublin Airport Authority (DAA) and former member of the senior team at Glanbia. In welcoming Mr Toland as keynote speaker, president of the WIT Postgraduate Business Society, Mark Kennan highlighted the value for business students of having the opportunity to meet and learn from invited speakers. He also noted how Ireland’s export economy has created a set of world class companies and a supporting eco-system of SMEs that in particular has created demand for internationally-orientated business graduates. He stated: “Our occasional speaker programme brings graduates to the cutting edge of their disciplines by offering exposure to senior business leaders and by providing insights into business, operational and managerial practices of leading Irish and international firms”. In his account, Toland highlighted recent successes for DAA noting in particular that Dublin is now the fastest growing airport in Europe (11% compared to the European average of 4%). He also addressed the key growth drivers for DAA including the abolition the of the air travel tax in 2014, the development of new and existing routes by Ryanair and the growth of transfer and transatlantic routes from Dublin. Equally Kevin spoke of the challenges facing DAA including regulatory and infrastructural challenges as well the new uncertainties presented by developments in the international business and political environments. There are 16,000 jobs directly associated with Dublin Airport and a further 108,000 jobs in the broader Irish economy associated with aviation (representing €7.6 billion of GDP). The international dimension is strongly embedded in the degree and postgraduate programmes offered at WIT Business School. Dr Thomas O’Toole Head of WIT Business School, remarked: “At undergraduate level our BA (Hons) International Business prepares students to live and work in an international and multicultural environment offering students a one year placement, living in a foreign country. While at postgraduate level, students have opportunities to pursue a double degree programme. The Masters in Business (Internationalisation) students take a number of common modules with students on the Master of International Business (MIB) programme at Brest Business School in France. As a result of the level of joint study and research involved, students on both programmes receive degrees from both colleges – a Double Degree”. These initiatives have helped to further strengthen the School’s international network of elite relationships, whilst also positioning graduates to take advantage of the internationalised dimension of Irish business and entrepreneurial opportunities. WIT has partner Institutes around Europe, as well as in the USA, Canada, China and India. For further information on on either the BA (Hons) International Business or Masters in Business Studies (Internationalisation) or the full range of business programmes visit the School of Business.